We here at Everything Is Noise hold Australian label Art As Catharsis in very high regards. It has become one of our favorite independent labels over time, aided by its dedication to supporting diverse and forward-thinking talent all over the musical spectrum. 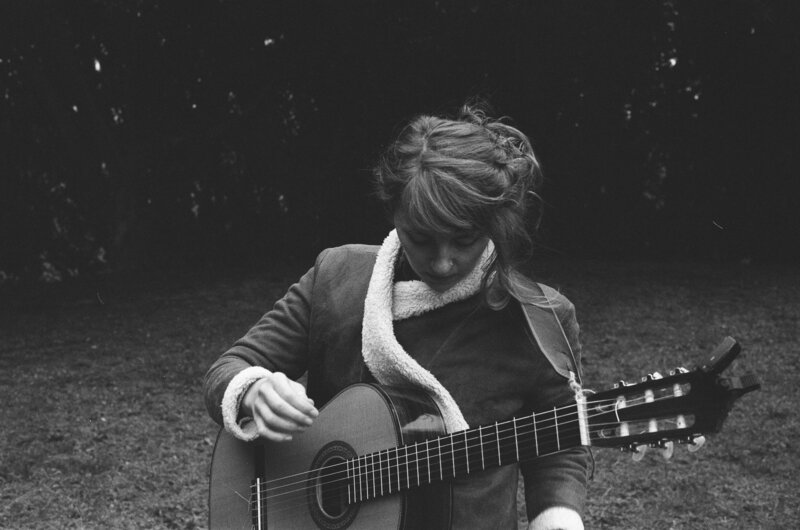 Bonniesongs, the stunning art-folk project by Sydney-based musician Bonnie Stewart, is a perfect example of the label’s philosophy. A stalwart of the Australian indie scene, Stewart’s solo venture into acoustic folk music draws inspiration from improvisational jazz (of all things). It carries itself with the experimental, otherworldly demeanor of artists like Björk or Joanna Newsom, while keeping the genre’s roots in honest, earthy sounds alive and intact. That is why we are proud to premiere her first single “Follow Me” for you today, which will be part of her four-song début EP Strings, due out on August 16 via AAC. Watch the video for “Follow Me” below! Together with her collaborators Freya Schack-Arnott (cello) and Sacha Bota (viola), Stewart (guitar, vocals) conjures up images of softly swaying vegetation, of spacious woods and uninhibited roaming all throughout “Follow Me”. It has a warm and comforting sense of escapism to it, inviting the listener to explore the peaceful world of sounds it presents, away from the effervescence of modern life, if only for a while. Her wispy vocals add to this ethereal atmosphere as well, accentuating the qualities of the intricate instrumental and adding another beautiful layer to the overall composition. With its carefree yet complex take on folk music, “Follow Me” serves as an enticing first look at Bonniesongs‘ upcoming Strings EP. If you liked what you heard, you can pre-order it here. I can only advise you to keep an eye (or even better, an ear) on this project, because if this is only the first taste of what’s to come from Bonnie Stewart, the future looks bright for her and her music. You can follow Bonniesongs on Facebook. Previous PostDelta Sleep - "Ghost City"
Next PostDenzel Curry - "TA13OO"